Missouri governor Eric Greitens has looked very much like a political dead man walking for a while. A report released last week by a special committee of the Republican-controlled legislature made the self-described “outsider” and “family values” pol look more like someone who might manage to give sexual predators a bad name: Greitens allegedly assaulted and blackmailed a woman he was having an affair with on the brink of his notably sanctimonious 2016 gubernatorial campaign. He now faces a trial for felony invasion of privacy, probable impeachment proceedings, and multiple calls for his resignation, as much from Republicans as from Democrats. Attorney General Josh Hawley is asking the St. Louis circuit attorney to file criminal charges against Gov. 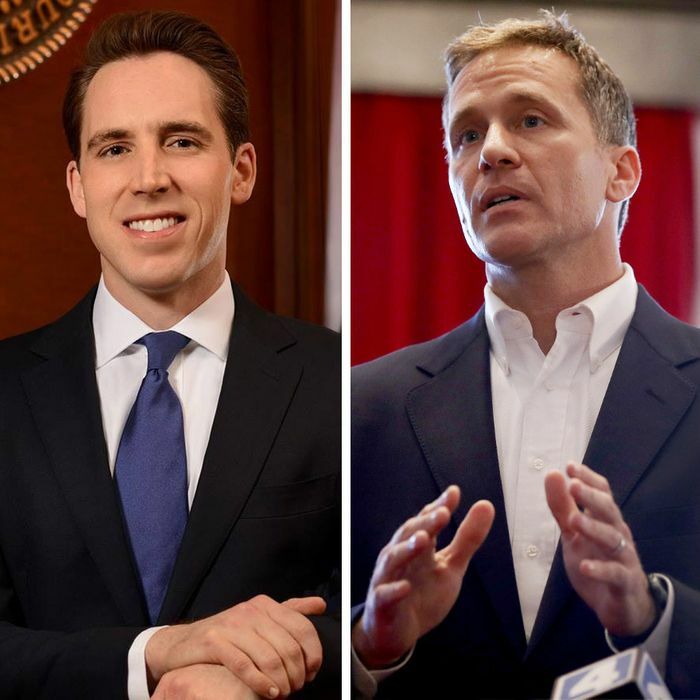 Eric Greitens for allegedly illegally obtaining a fundraising list from a charity he founded for political purposes…. This particular matter stems from Greitens’ successful 2016 campaign for governor. It involves how his campaign received a fundraising list from the Mission Continues, a veterans charity that Greitens help found before he ran for office. Hawley announced on Tuesday that his office had evidence that Greitens illegally obtained that fundraising list. This is not a new allegation; it dates back to an October 2016 Associated Press story noting how many donors to Greitens’s charity were showing up as donors to Greitens’s campaign. Now, though, Hawley is recommending criminal charges for the crossing of campaign-finance-law lines. And worse yet from the governor’s point of view, the prosecutor with jurisdiction over these matters is the same one trying to send him to the hoosegow for the privacy and blackmail charge, St. Louis circuit attorney Kim Gardner. Greitens’s whole strategy on that front is to accuse Gardner of being a godless liberal stooge of George Soros (who contributed to groups that supported Gardner’s campaign to become the first African-American circuit attorney in her city) who’s performing a political “hit” on the doughty governor. It’s inconvenient that his fellow Republican Hawley, who will more than likely be the GOP’s nominee to try to take down Democratic U.S. senator Claire McCaskill, is apparently now in league with the evil Gardner. To say it’s getting ugly in Jefferson City is an understatement. And you’d have to figure that Hawley and other Missouri Republicans facing voters this November would just love to throw their governor under a fast-moving bus headed anywhere else.